Gmicky, the G'MIC mascot, artwork by David Revoy. 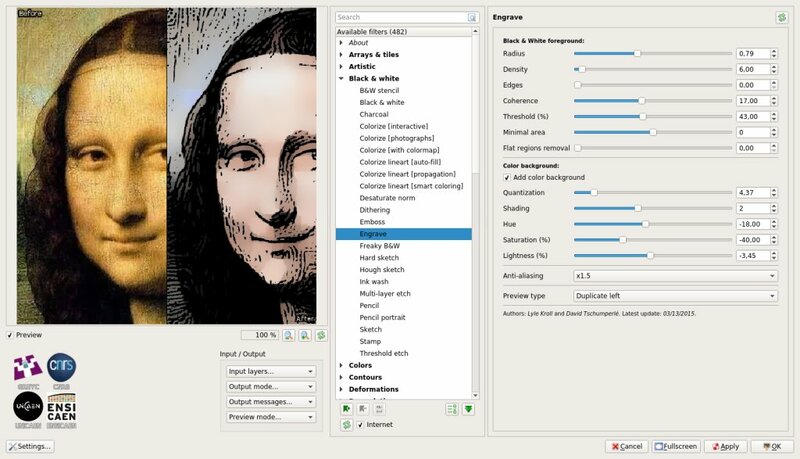 G'MIC is a full-featured open-source framework for image processing, distributed under the CeCILL free software licenses (LGPL-like and/or GPL-compatible). It provides several user interfaces to convert / manipulate / filter / visualize generic image datasets, ranging from 1D scalar signals to 3D+t sequences of multi-spectral volumetric images, hence including 2D color images. 1 - gmic, a command-line tool to use the G'MIC image processing features from a shell. 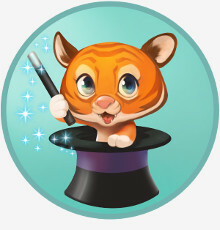 In this setting, G'MIC may be seen as a friendly companion to the ImageMagick or GraphicsMagick software suites. gmic, the command-line interface of G'MIC. 2 - libgmic, a small, portable, thread-safe and multi-threaded, C++ image processing library to be linked to third-party applications. 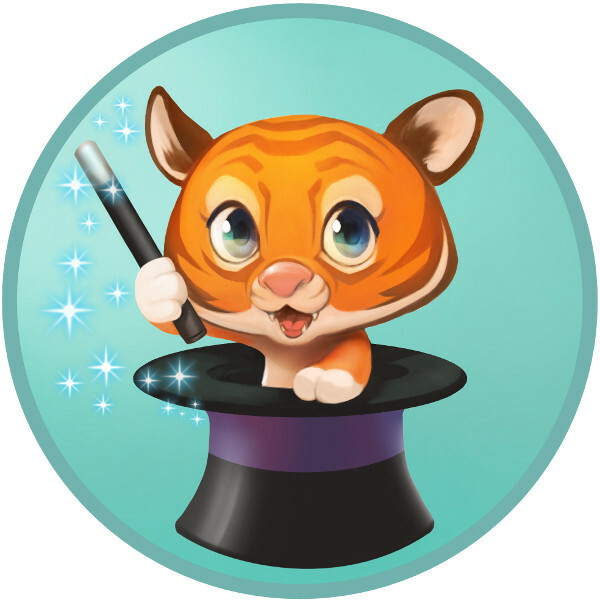 Its simple API allows programmers to add all G'MIC features in their own software without much efforts (a C API is available as well). libgmic, a small, thread-safe, multi-threaded, C++ image processing library to embed all G'MIC features in third-party applications. 3 - G'MIC-Qt, a plug-in to bring G'MIC capabilities to the image retouching and painting software GIMP, Krita and Paint.NET. More than 500 filters are already available, sorted by category (Artistic, Black & white, Colors, Contours, Deformations, Degradations, Details, Color Grading, Frames, Layers, Light & shadows, Patterns, Rendering, Repair, Sequences, etc.). The G'MIC plug-in in action! 4 - G'MIC Online, a web service to allow users applying image processing algorithms on their images, directly from a web browser. G'MIC Online, the web service to use G'MIC from a browser. Screenshot of ZArt in action. , a Qt-based interface for real-time processing of video streaming coming from webcams or video files. ZArt, a real-time video processing software using the G'MIC processing library. 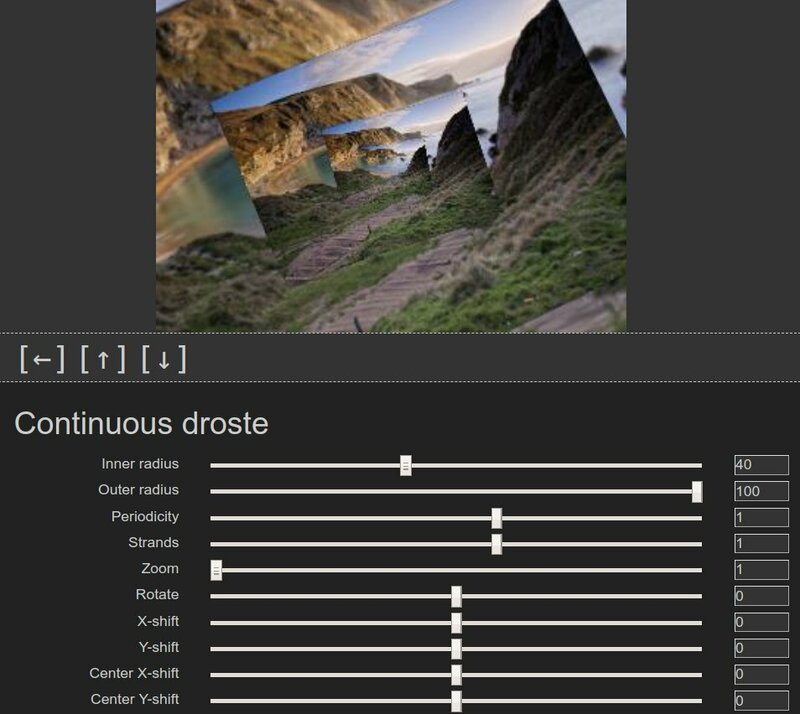 EKD, a free software dedicated to postproduction processing for videos and images. Flowblade, a multitrack non-linear video editor for Linux released under GPL 3 license. Photoflow, a fully non-destructive photo retouching program. Veejay, a visual instrument and realtime video sampler. Here are some screenshots illustrating various uses of G'MIC. 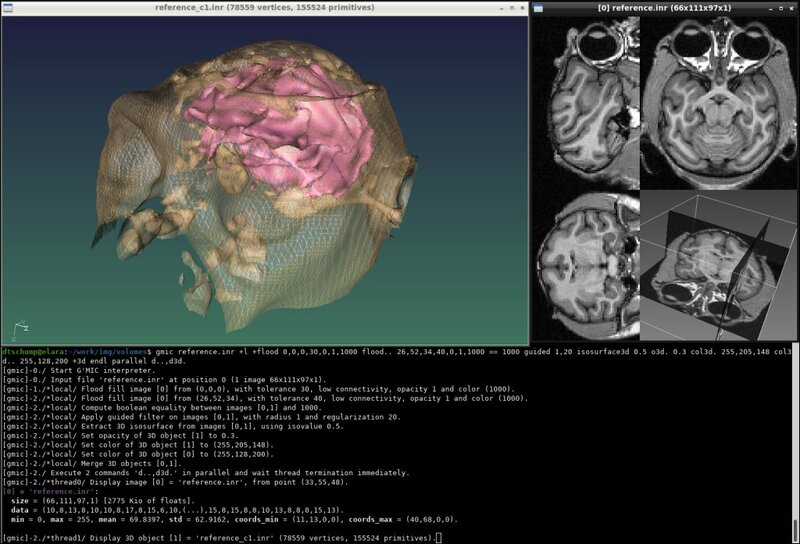 It shows how it is able to process and visualize different types of 1D/2D/3D image datasets. G'MIC is actually a handy toolbox for many image/signal processing applications. See also the Gallery section for more detailed examples on its use. You can also try the online version of G'MIC to try some of the filters it proposes. G'MIC is focused on the design of possibly complex pipelines for converting, manipulating, filtering and visualizing generic 1D/2D/3D multi-spectral image datasets. This includes of course color images, but also more complex data as image sequences or 3d(+t) volumetric float-valued datasets. 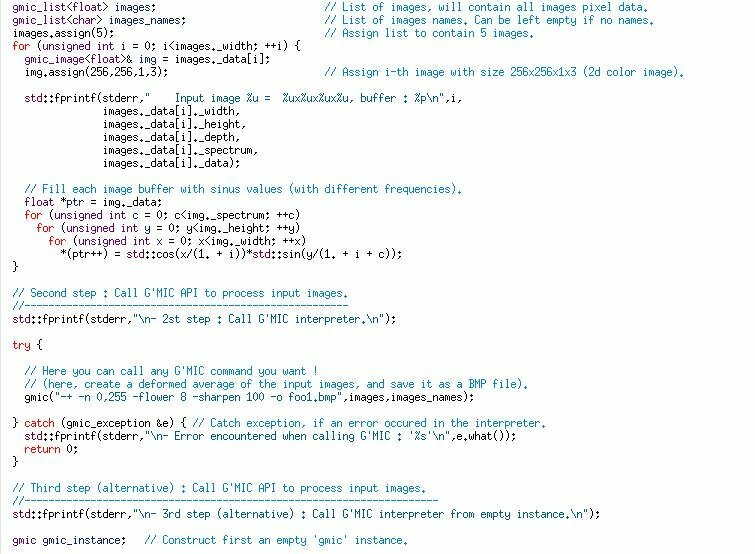 To do so, G'MIC defines a lightweight but powerful script language (the G'MIC language) dedicated to the design of image processing operators and pipelines. G'MIC is an open framework: the default language can be extended with custom G'MIC-written commands, defining thus new available image filters or effects. By the way, G'MIC already contains a substantial set of pre-defined image processing algorithms and pipelines (more than 1000). G'MIC is natively multi-threaded. It uses OpenMP to take advantage of multiple cores for speeding up the computation of image processing operations. G'MIC has been designed with portability in mind and runs on different platforms (Windows, Unix, MacOSX). 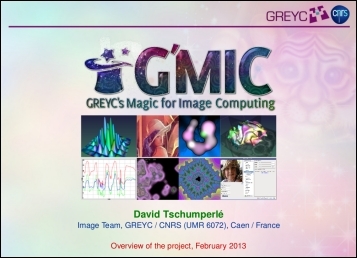 Since 2008, it is mainly developed in the Image Team of the GREYC laboratory, in Caen/France, by permanent researchers working in the field of image processing on a daily basis. It can process a wide variety of image types, including multi-spectral (arbitrary number of channels) and 3d volumetric images, as well as image sequences, or 3d vector objects. Images with different pixel types are supported, allowing to process flawlessly images with 8bits or 16bits integers per channel, as well as float-valued datasets. It provides light but efficient visualization modules dedicated to the exploration/viewing of 2D/3D multi-spectral images, 3d vector objects (elevation map, isocurves, isosurfaces,...), or 1D graph plots. It is highly extensible through the possible inclusion of custom command files which add new commands that become understood by the language interpreter. Thus, users can design their own image processing library on top of G'MIC. It proposes commands to handle custom interactive windows where events can be managed by the user. It is based on the latest development version of the CImg Library, a well established C++ template image processing toolkit, created and maintained by the same team of developers since 1999. Sébastien Fourey (G'MIC-Qt, G'MIC online and ZArt). If you appreciate what we do on G'MIC, please consider supporting us ! Sylvie Alexandre (packaging, testing, filters). Jérome Ferrari (testing, code, tutorials). Andrea Ferrero (testing, code, builds). Dan Leinir Turthra Jensen (debugging). Tom Keil (testing, filters, tutorials). Sander Knopper (testing, cmake build). Alan Kwan (afre) (testing, filters). Angelo Lama (testing, EKD integration). Stephane de la Linuxerie (design). Boudewijn Rempt (Krita integration, code, testing). David Revoy (mascot design, testing). If you appreciate G'MIC, feel free to hang a flyer somewhere to make this project more visible! 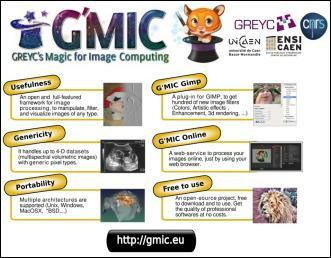 To learn more about the G'MIC project, you can also look at the presentation slides!